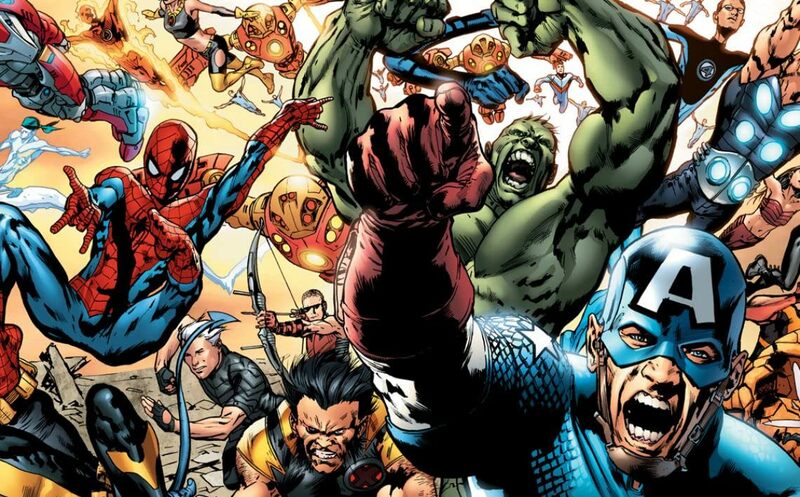 In the Ultimate Universe, familiar heroes and villains are re-booted for the contemporary reader. Defined by its edginess and explosive action, Ultimate Marvel has introduced new generations of fans to classic characters. Now, with its final moments on the horizon, check out our favorite Ultimate Marvel moments! A new Spider-Man rises following Peter Parker's death. The first appearance of Ultimate Spidey, Miles Morales! See why legions of fans adore the young Brooklynite-turned-hero. In the final issue of the first Ultimates series, the team takes on a rogue Hulk...and a Chitauri invasion! The shape-shifting Chitauri have laid waste to the inner echelons of S.H.I.E.L.D. In their final bid for humanity, the Ultimates deliver their A-game. You won't be disappointed! Ultimate heroes; X-Men, Fantastic Four, Spider-Man, and more, unite in this heart-pounding event! In the first issue, a series of terrorist attacks shakes up the status quo. Who, or what, is behind this destruction? And why was Roxxon taken out first? One of the most monumental events in Ultimate Marvel history. Norman Osborn and his crew of villains are hot on the trail of Spider-Man. Will Peter Parker catch wind of this pursuit before he loses the ultimate battle? The first part of "Death of Peter Parker", the story arc that is still being felt in comics today. Gah Lak Tus, Ultimate Marvel's version of Galactus, comes. And Gah Lak Tus comes with a deadly neuro-virus that, if unleashed, would make Earth uninhabitable. Earth's Ultimate heroes unite to prevent worldwide Extinction. But how is detective Misty Knight central to Earth's salvation? Part 1 of a 5 part event starring Ultimate FF, Iron Man, X-Men, and Silver Surfer! The origin of Marvel's Ultimate mutants revealed. And the answers will appall you. Sue Storm becomes inhabited with the Watcher's consciousness, and revelations emerge in spades. What has been hidden from humanity will be a secret no longer. Magneto has declared war against humanity. Will Marvel's Ultimate heroes be up to the challenge of eliminating a tyrannical overlord? You bet! This is Ultimate War, the cataclysmic event that pits hero against hero, and mutants against the world. Brother takes arm, and hammer, against brother, as Ultimate Thor battles Loki in the concluding issue to the Ultimates 2 series. Washington D.C. runs amok with Asgardian demons. Will Thor summon the powers of Odinson to save Midgard from imminent doom? Strange weather patterns have alerted the attention of Ultimate heroes and villains. In the eye of this apocalyptic storm, who will fall? The first part to Ultimatum, the massive event where Magneto's quest to conquer humanity will leave the Ultimate Universe in shambles, with the corpses of heroes and villains alike in his wake. Kitty Pryde saves the universe! When the fate of the world rests on the shoulders of a young mutant, what hope exists? The explosive conclusion to Cataclysm, the 5-part cosmic event that pits Ultimate heroes against Marvel's mainstream Galactus! An Ultimate X-Men adventure that will leave fans begging for more! After ditching the Institute for a life of crime with Gambit, Rogue finds she is overpowered when Juggernaut, nursing old wounds, appears in Vegas. A battle for the ages between Juggernaut, Gambit, and Rogue! Featuring plenty of property damage.